Coney Apple is a crisp, sweet green apple covered in rich, gooey caramel. Not one of my favorite but I actually mixed this flavor with the other apple in this line the green party and it was pretty good! i love mixing and matching flavors. Especially flavors that are similar but different from each other. The apple and caramel really stands out from this one. Not a huge apple fan but wanted to try this one on a whim. I like a few of the other caramel flavors they carry so thought this one might be good too. I think the caramel makes it much better than it being just apple. This one is on the sweeter on side. Decent but wish it had more of an apple taste. Caramel you can taste though. And it is sweet and a bit sour as well. Shipping was very quick and I like that it shipped same day. I liked this one. But I did this it was a little bit too heavy on the caramel. I did really like the apple taste that it had. I think if people like the Green Party then they will like this one too because its fruit and dessert in one. I really love caramel flavors because they remind me of a good light brown sugar. I'm not sure why! But I like this one because it is a great green apple taste and the caramel makes it pretty sweet. Haven't had a good caramel apple flavor in a long time! I've tried multiple caramel candy apple vapes since I began vaping but this one is my favorite out of all of the ones that I have tried. 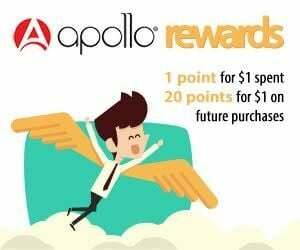 Apollo always does e-liquids the best! You can taste the sweetness from the caramel and the tartness from the sour green apples when vaping. I taste both on the inhale and exhale. Cannot put this one down. nice clouds great flavor ! Switched to this one after having tried an alternative e-liquid bought in a shop downtown for the same price and believe me, the difference is absolutely disconcerting. To be fair, it's not even a contest. Hats off to the Apollo e-liquids! Bravi! Like this one, especially to mix.